Metal polish has applications in both the home and garage, but many users of the product are unaware of its ingredients. This lack of knowledge can contribute to improper usage as well as possible health hazards. Keep in mind that ingredients may change in new formulations and vary between companies or manufacturers. Ammonia is a colorless and corrosive gas that helps to wipe a surface clean. The inorganic chemical is also known as hydrogen nitride. It may appear in combination with acids or in cleaners under the name of ammonium hydroxide. Denatured alcohol or ethanol combines with chemicals to create a solvent to remove dirt. No coatings will thin out, and it is possible for the product to dissolve in water. Small amounts of the ingredient are seen in products such as toothpaste under the name SD alcohol. The Code of Federal Regulations mandates its use. Petroleum distillates are hydrocarbon solvents made from crude oil. The volatile organic compound is highly flammable. Naphtha is one of the derivatives of the distillates. Special refineries produce the item as a solvent. It is a colorless liquid stream that changes its dissolving property after each refinement. Several acids are a part of most metal polish formulas to break down dirt and grime. Oxalic acid is somewhat flammable as well as odorless. Colorless crystals will become unstable in heat to produce carbon monoxide. Phosphoric acid contains water. It appears as a colorless liquid that replicates the texture of heavy syrup. Sulfuric acid is thick and oily. The acid has no odor until the application of heat, when a choking odor appears. 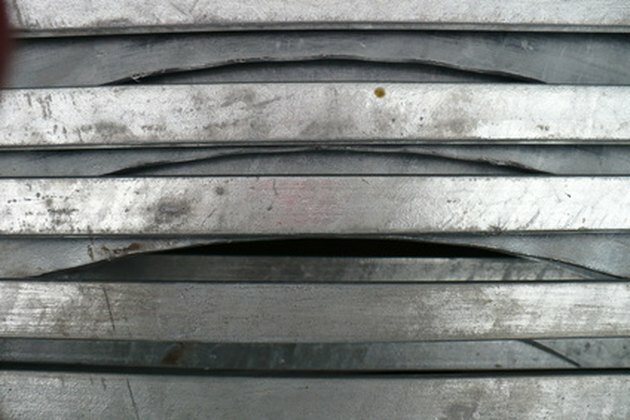 Extreme corrosiveness occurs when the acid is near aluminum, copper and stainless steel. Phenolic derivatives, also known as carbolic acid, must be kept cold and dry. The crystals have an odor but can also give off carbon dioxide and carbon monoxide during heating. Tripolyphosphate is a triphosphoric acid sodium salt that comes in a powder form. Copper especially brings out its corrosive properties. It may also be in use to soften water or a texture. Thiourea is most commonly in use to clean silver. Storage should always be in a cool, dry place. Somewhat water soluble, it is stable but not compatible with hydrogen peroxide, oxidizing agents and nitric acid. Heating thiourea will release carbon oxide as well as sulfur oxide. Silica combines sand or gravel with high silicon dioxide. Quartz, sand and agate have an abundance of the element. The primary use of silica is to hold a compound together by fusing with other substances. Nicole Alexander has been writing since 1994. Her articles can be found on various websites. Alexander plays soccer, hockey and tennis and participates in various outdoor activities. What Is the Difference Between a Cinder Block and a Concrete Block? What Is a Heating Coil Made Of?